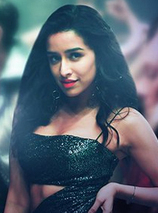 to get instant updates about 'Shraddha Kapoor Photos' on your MyPage. Meet other similar minded people. Its Free! shraddha kapoor photos says "Haseena - The Queen of Mumbai is an Indian biographical crime film directed by Apoorva Lakhia and produced by Nahid Khan. Shraddha Kapoor's first female protagonist along with Siddhanth Kapoor portraying the role of Dawood Ibrahim, Sharman Joshi plays as police inspector and Ankur Bhatia plays the Haseena's husband"